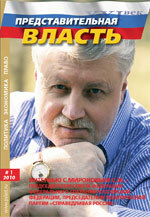 The lead article of Issue 1 / 2010 of “Representative Power – Century 21” is “2010 – International year for the Reapprochement of Cultures” by Kanaev N.M.
Other important publications include an interview with Sergei M. Mironov, Chairman of the Federation Council FS RF, Chairman of “Fair Russia” political party, and the following articles: “The interests of the country above all” by Fahritdinov I.Y. ; “Exchange of experience between Russian and Lithuanian parliamentarians on improvement of legislation on healthcare” by Lyubimov A.P., Ignatov Yu.S. ; “Russia's "limping" fire security” by Trunov I.L. ; “Market equality and Russian realities” by Mkrtchyan S.S., Mkrtchyan G.M. ; “A new stage in development of Russian Cinema” by Paulsen-Gagarina T. and other articles by Veremeeva O.V., Ivanchenko A.V., Avakyan and Yadykin V.A. Neschadin А.А. Shall we fly? Abstract. The article considers fire security context in the circumstances of specific tragedy in Perm' as well as in the frame of whole Russia. Examples are given, development trends analyzed, and the necessity of legal amendments showed. On the international instances author bases his conclusions, including particular suggestions on enhancing of fire security for the Russia's people. Key words: big fire, regulations on fire security requirements, causes of most people's death, slovenliness growing to state danger, about fire security, monetary, administrative and criminal punishments. Abstract. The author of the article has attempted to analyze the history of inception and development of the budgetary process in Russia. The focus has been made on the pre-revolutionary period of Russian history. Russia has been developing annual budgets since 1803. Publication of the budget was first introduced in 1862. The first public discussion of the budget was performed by the Third State Duma on November 27, 1907. These important milestones were crucial for the following development of the budgetary process in Russia. The article dynamically describes the main stages of the budgetary process such as budget execution and approval of the budgetary report. The author generally overviews the major tendencies in the development of the budget-related legislation in Russia. Key words: budgetary process, estimate rules, budget rules, budget system, budget, budgetary reporting, budgetary rights, results-based administration, middle-term budget planning, financial control. Avakyan S.A. A review of book “Electoral legislation and electoral process in decisions of the RF Constitutional Court, 2000-2007. In 2 vols. (Moscow: RF TsIK, 2008). Abstract. In the present article the clauses in the presence of which the application of the protection of consumers' rights legislation to relations that follow from the agreement of participation in share construction of real estate objects, are considered and the conclusions about the necessity of the introduction of changes in part 9 clause 4 of the law “Participation in share construction” are drawn.